I came across this poem a few years ago and fell in love with it. It wasn’t until recently when my hubby wanted to give a meaningful gift to his mentor, did I reread it. Since then, I’ve found myself frequently searching for it on the internet just so I can reread it at all hours of the day. There is something so inspiring and yet humbling about the words. I don’t possess very many of the traits Kipling says you should possess, which is why I’m so drawn to it I suppose, but a girl can try. In order to remind myself of the words, meaning and symbolism of this poem, I decided to make something I can look at all the time. Hope you enjoy this poem as much as I do! Filed under Click, Clack, Write. Tagged faith, free printables, inspiration, role models. Thanks for this printable and frame-able copy of this awe-inspiring poem! 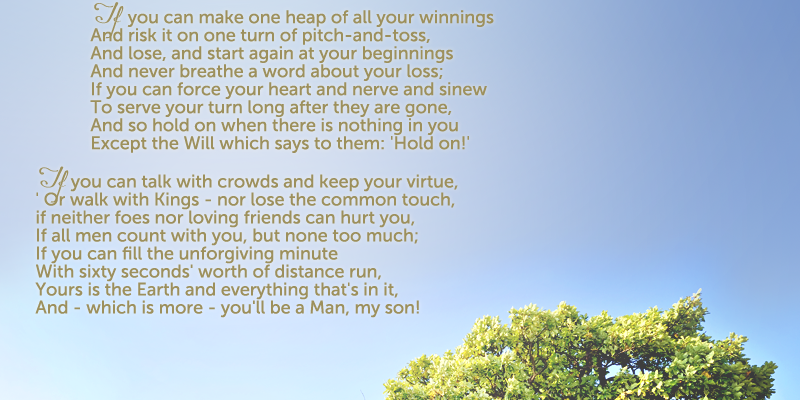 Kipling was without a doubt wise beyond his 31 years. My Mom, now 89 years old, read this poem to her 6 children when we were still in grade school, and a copy of it was in one of the bedrooms in our home for years. Although I’ve thought of particular lines of the poem often throughout the years, today at 57 years old, after recently experiencing mistreatment, misjudgements, and misperceptions at work, I sought out this poem. I realize that I also had and have a role to play in all of this. I will print this out and frame it. Again, thanks! Thank you for this printable copy. My Father, born in England, taught me this poem. When I was growing up and would misbehave like children do, as a punishment I had to write out this poem [copy it at first and then later on had to use my memory]. Subsequently it is locked in my mind and throughout my 67 years I have pulled it out to help me in many scenario’s life presents us all with. I am so truly grateful to my Father for this timeless tool. I am preparing for my Granddaughters 20th birthday and will be attaching this with her gift. Thank you again! I love this poem so much, too! Another thanks from someone whose high school teacher pasted it on the wall of the store room and who has fallen in love with it ever since! I practically had it memorized and even wrote it out more than 20 years ago, but I’ve never been able to find one beautiful enough for printing, nor any posters of it in my country. Thanks again! 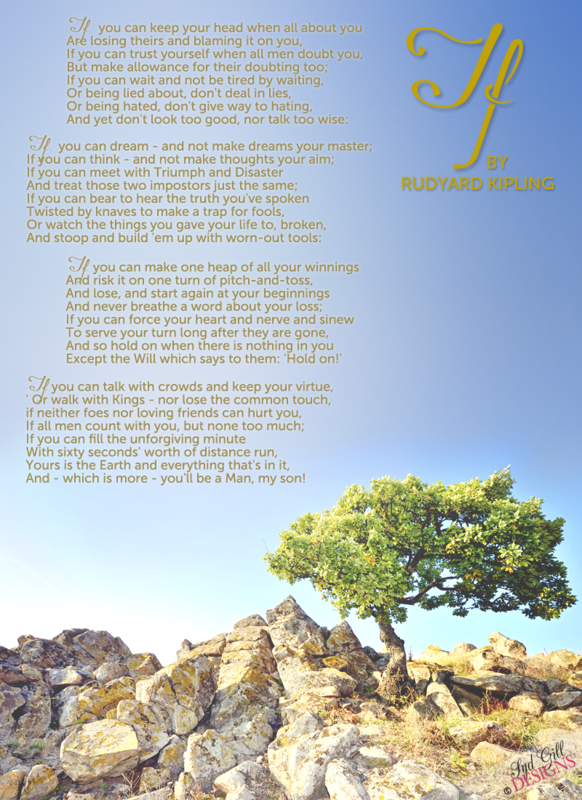 I wish to obtain a simple printable coy of Kipling’s poem IF. Please help me. Thank you. I learned only two hours ago the background of Kipling’s poem, IF. I was listening to “Tinyburg” on BBN Radio, 91.7 FM, Sat., 9:30 p.m. The storyteller said that it was written for Kipling’s son, and that son was killed in WWI when he was only 17. I’ll have to send you a copy of IF for Girls, by another author. A framed copy was given to me by a young aunt who had just lost her husband in WWII. I remember the lines about “not let dreaming lead you to disaster,” and “to say that firm unconquerable No.” It, too, made a lifelong impression. My grandfather displayed this poem next to his dining table. He was a POW in world war 2. I have just printed this as a gift for my friend’s new born son. It is beautiful.